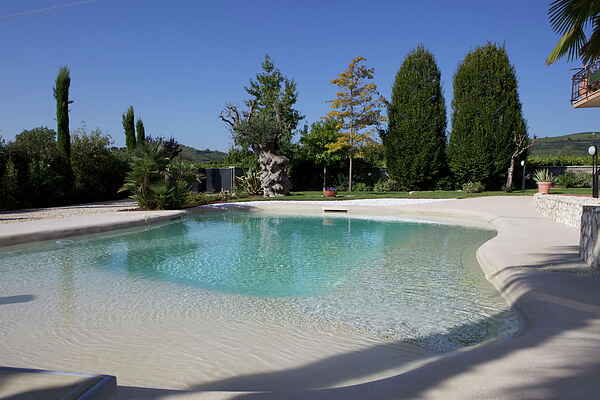 "Villa scaligera" is a comfortable and spacious semidetached house with a beautyful pool (with Jacuzzi) and a well finished fenced garden. It's located in a small town in the middle of the Soave winefields. It is only 30 minutes from Verona and 50 minutes from Garda's lake, it is easy to reach by motorway. This modern furnished accommodation (for 8 persons) is set on the ground floor. You have a private parking, swimming pool with sunbeds and covered patio with dining table. Your dogs are welcome, the house owner is a animal lover and he is a certified riding instructor so you can learn to ride horse in the onsite riding stable of the accommodation. The houseowner, an expert attendant, gives lessons on the paddock and offers guided excursions in the surroundings (for beginner or expert rider). This modern furnished apartment gives you a perfect and private feeling and it's ideal for every kind of guest: family, nature lovers (free space around, quiet surrounding,..), wine and food lovers (there are many typical restaurants, winery,..), people who wants to discover the culture of the area or to practice sport (pool, golf, riding horse, trekking,..) or simply for relaxing. From there you can easily reach Vicenza, Padua, Venice or Garda's Lake. Linen package: change every 7 days. - Altitude: up to 800 meters. - Snack *: € 25 \/ person. Services that must be agreed directly with the owner. - Age: from 18 years onwards, 5 lessons (one hour \/ lesson), 150 Euro. - Age: from 18 years onwards, 5 lessons (two hours \/ lesson), 220 euros. The interesting surrounding area: Padua (a historical university town rich in culture, with works by Giotto), Vicenza (architecture and the Palladio villas), Venice (cultural, political and moral capital of the Veneto region, as well as a spectacular place to visit), Sottomarina, Jesolo, Caorle (sea and beach), Verona (Arena, Romeo and Juliette) and Lake Garda (beaches, surfing and amusement parks).